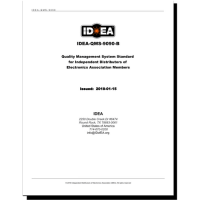 IDEA-QMS-9090: Quality Management System Standard for Independent Distributors of Electronics Association Members was developed to establish specific requirements and practices Independent Distributors of electronic components can use to help ensure that they satisfy their customers’ requirements. 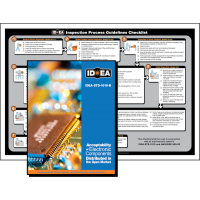 These requirements and practices serve to address many of the unique aspects of the Independent Distribution of Electronics Industry which are not addressed in other QMS standards. The proliferation of substandard electronic components and the threat they pose to safety, national security, product performance, and successful commerce have long been a source of grave concern to IDEA and its Members and have prompted their action to identify solutions to combat this serious problem. IDEA firmly believes that part of the answer to securing the supply chain resides within an expanded and concerted effort in the cooperation and education of all stakeholders responsible for purchasing and inspection practices through the implementation of relevant standards, training, and certification programs. 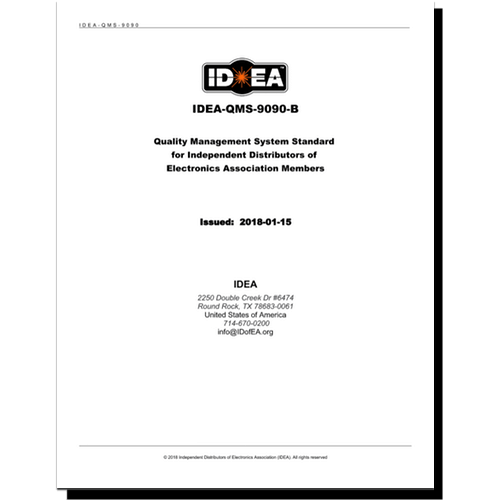 IDEA has developed IDEA-QMS-9090: Quality Management System Standard for Independent Distributors of Electronics Association Members as a tool to significantly contribute to this purpose. 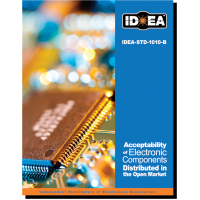 The objective of this commercial Standard is to establish specific requirements and practices Independent Distributors of electronic components can use to help ensure that they satisfy their customers’ requirements. These requirements and practices serve to address many of the unique aspects of the Independent Distribution of Electronics Industry which are not addressed in other QMS standards. Since this is a consensus based Standard, the input of all Members was taken into consideration with a focus on producing a valuable Standard that is applicable to a wide range of Independent Distribution business models. In order to ensure the applicability of this Standard to a broad Industry, additional views were taken into account that included, but were not limited to, Original Equipment Manufacturers (OEMs), Original Component Manufacturers (OCMs), Electronics Manufacturing Services (EMS) Providers, Test Services Companies, and various other Service Providers. Although this Standard seeks to standardize specific QMS requirements for IDEA Member Companies, it was not created to inhibit the creativity and innovation of the Independent Distributor adopting its requirements. Rather than replace the existing diverse business models and QMS practices of Independent Distributors, the requirements specified in this Standard are meant to complement and further enhance those distinguishing characteristics. 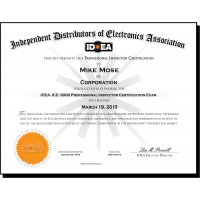 In order to assess the Independent Distributor’s ability to meet customer requirements applicable to the service that the Independent Distributor provides, certification to this Standard is mandatory for all Independent Distributors that are Members of IDEA. Conversely, only Independent Distributors who are Members of IDEA or have been conditionally approved for Membership by meeting all requirements within the application policies and process may qualify and become certified to IDEA-QMS-9090. To enhance the compatibility of IDEA-QMS-9090 with the ISO 9001 International Standard and to facilitate effective integration with existing ISO 9001 Quality Management Systems, IDEA has incorporated the numbering system and section titles of ISO 9001:2008 with the permission of the International Organization for Standardization (ISO). IDEA-QMS-9090B is available in a non-printable electronic Digital Rights Management (DRM) format only.